Driving to raise funds and awareness for breast cancer. Trucking for a Cure is one of the largest truck convoys in North America, bringing together cancer survivors, truck drivers and supporters. Each year, a convoy of 70 trucks travel across Ontario to raise awareness and funds for breast cancer. Since 2010, Trucking for a Cure has raised more than $400,000 for the Canadian Breast Cancer Foundation. Help us raise funds and awareness to drive out cancer one mile at a time. Donate to support our fight against cancer. Trucking for a Cure began with Joanne MacKenzie, a truck driver of nearly 25 years. After surviving breast cancer – the second leading cause of death for Canadian women - Joanne started the annual event. The convoy is in memory of her aunt, who passed away from breast cancer, and all the men and women who continue to fight the disease. 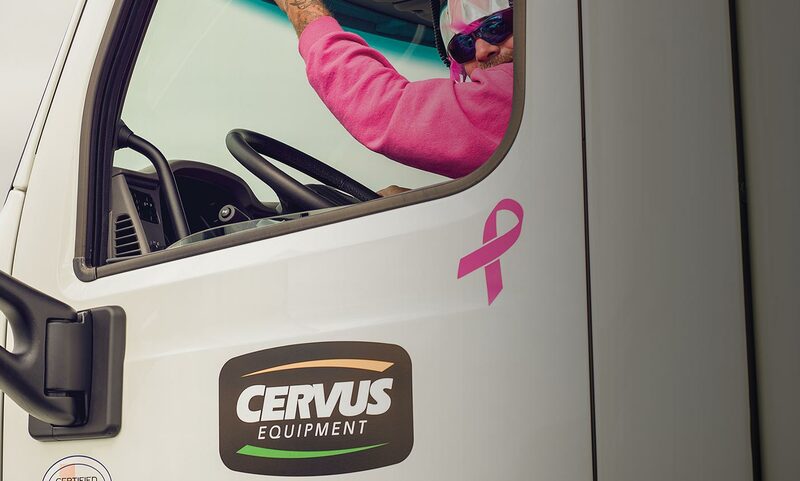 Cervus Equipment is a pink ribbon sponsor for Trucking for a Cure, raising $25,000 for breast cancer research each year. Since 2013, Cervus Equipment has led a convoy of passionate truck drivers across Ontario in pink outfits and decorated Peterbilts. Each year, Cervus Equipment brings together employees, customers and supporters to help fundraise and fight breast cancer. In 2013, Cervus Equipment donated a bright pink Peterbilt truck to Joanne MacKenzie to recognize her contributions and help her lead Trucking for a Cure forward. Joanne drives her pink Peterbilt each and every trucking route, bringing attention to breast cancer with her bright pink Peterbilt; driving out breast cancer one mile at a time.